Today over lunch at work, I listened as my coworker recounted some amazing adventures he had as a young man traveling in remote parts of Italy. I was so enjoying his stories, it made me feel a sort of ache in my heart that for the first time in a long time I didn't have an exciting trip on the calendar. We're parents now and life is a bit slower, even though I have faith we'll be back on the road soon - all three of us. 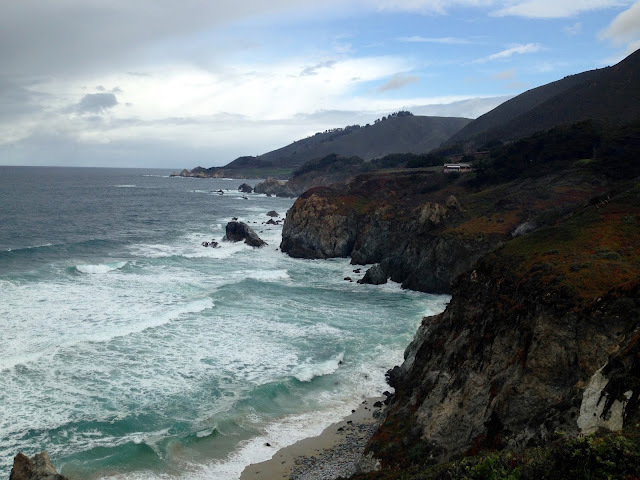 I'd always wanted to do the scenic California Pacific Coast Highway road trip, and almost exactly two years ago this April, we finally got to it. I've also never missed an opportunity to share our travels in the five years I've been writing Neurotic Kitchen (check out Spain, France, Italy and San Francisco/Napa here), so I honestly can't account for why it took me so long to tell you about one of our favorite vacations here the States. Nonetheless, I'll chalk up today's trip down memory lane to both wanderlust and nostalgia. I would recommend the So-Cal road trip we took to anyone, so if you're looking for a ready-made itinerary with plenty of restaurants and things to do on it, you're in luck. Now, back to spring of 2014; fresh off our jaunt to the San Francisco area, we were looking forward to returning to the golden state to explore its southern half, and this time we planned to just land at SFO before heading immediately south, ending up in Los Angeles. I will share our full itinerary in the hopes that you can benefit from our planning (this trip's timing and overall ease was great, as were all our accommodations and most every meal), and I'll of course include some of the fantastic food and scenery we took in on our weeklong west coast adventure. 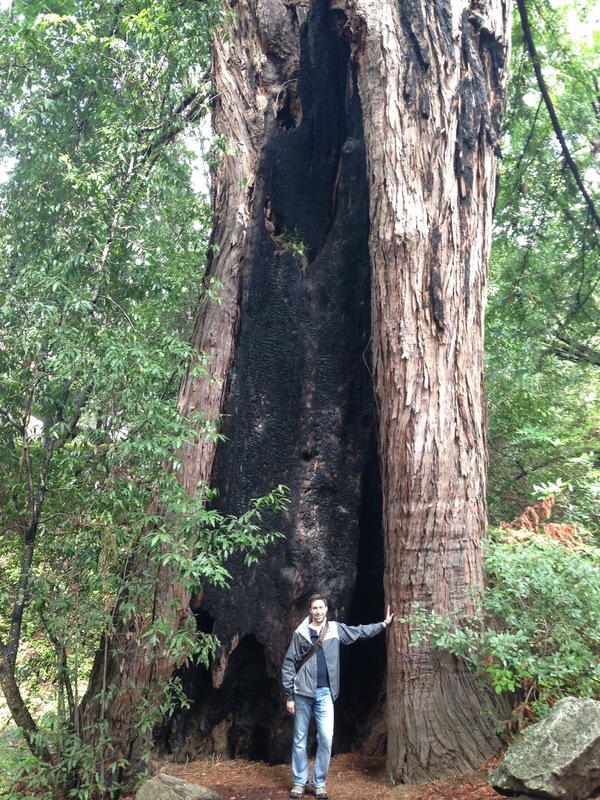 Land in San Fran and head just a bit South to Palo Alto - my techy husband loved being in Silicon Valley. Quick lunch pilgrimage to In and Out Burger - naturally! Dinner at Tamarine - an excellent, high-end and delicious contemporary Vietnamese restaurant. Stay We opted for the Crowne Plaza Cabana in Palo Alto - just a few miles from center of town and all the action, but a serviceable accommodation at a very fair price. Just fine after a long day of travel. 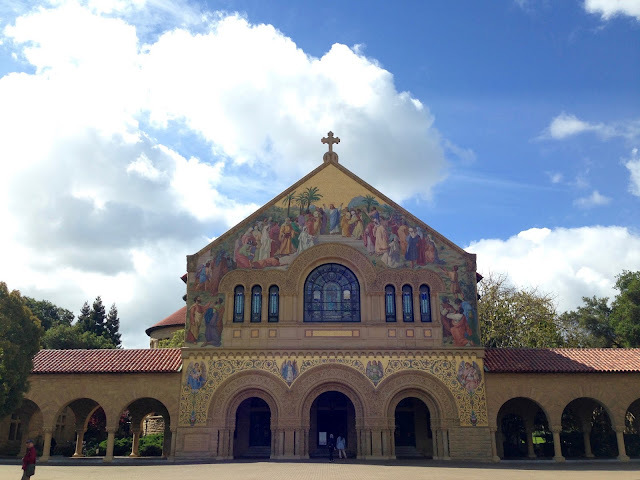 Attraction: It was time to set off for Southern Cali, but first a visit to the gorgeous grounds of Stanford University, a field day for an architecture buff. 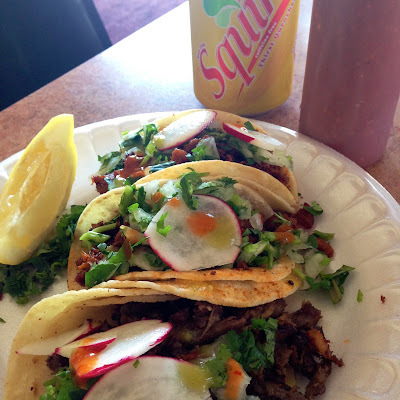 Lunch in Santa Cruz - Tacos Moreno. This place was excellent and authentic. 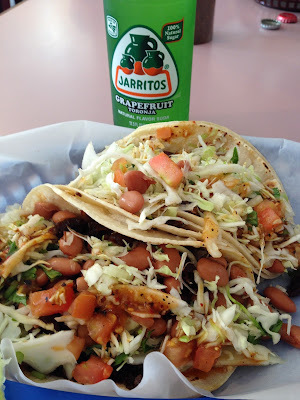 I strongly preferred the burrito to my usual favorite, Tacos al Pastor. On the way out of town, we stopped by carnival-like Santa Cruz boardwalk, much to the delight of my Jersey-Boy husband. Dinner Montrio Bistro - a bit off the strip in a less touristy part of Monterrey, this is a charming little bistro. 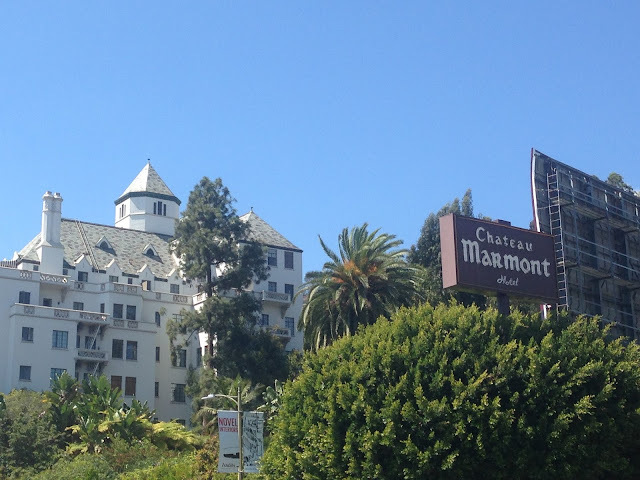 Stay at the lovely Monterey Plaza Hotel. We splurged on a bay view room. VERY nice hotel. We ate at the restaurant onsite one evening of our stay and it was quite good too. 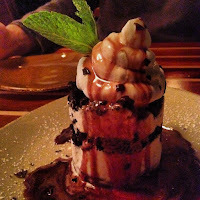 We enjoyed their Cioppino and this insane mudpie (right) for dessert. Attraction: The Famous Monterey Bay Aquarium and Cannery Row - famous for being the place where the Sardine Canning factories stood. The aquarium, set in a converted canning factory itself, was a great activity for the second day of our stay in Monterey, when the weather was a bit more foreboding. A short walk from our hotel, the aquarium is incredibly impressive. 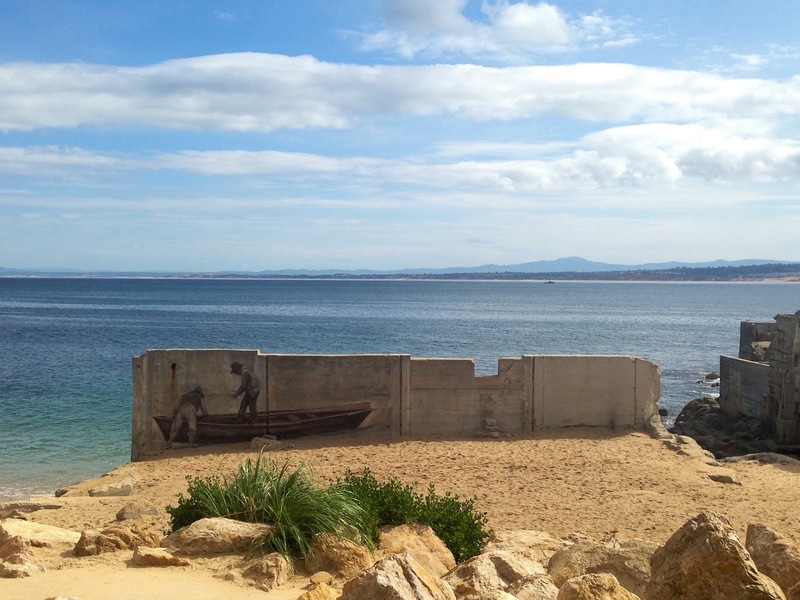 The site was also the setting to the the famous Steinbeck Novel, Cannery Row. 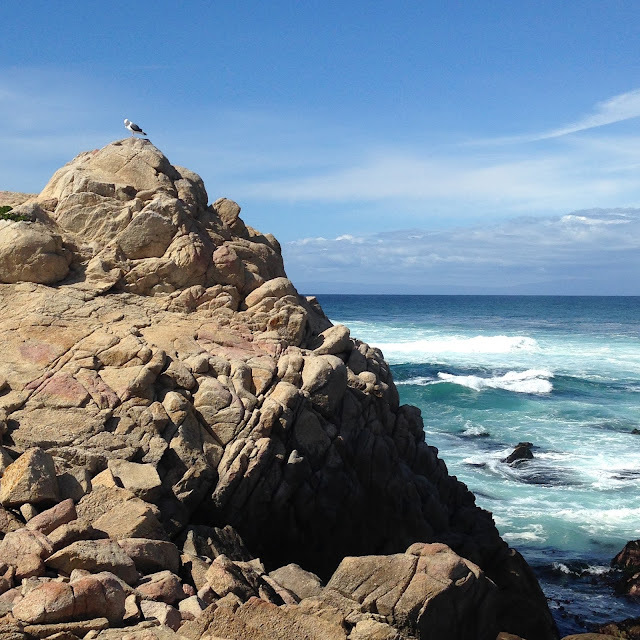 Keep in mind this area is terribly touristy and commercial, but Monterey is beautiful and the aquarium is worth the trip. On the road again, this time through the mountains! Attraction: Big Sur - A stop at this very gorgeous, expansive national park is a must for any Southern California road trip. Lunch Before arriving at our hike destination, we popped in for an early eunch at the Big Sur Roadhouse - AMAZING! 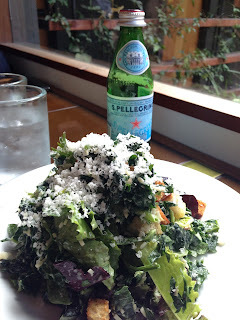 I had the most delicious Kale Salad, and the place itself was just charming for super fresh farm to table food presented simply. Refreshment As we drove out of the park, we passed a restaurant carved out of the hills called Nepenthe - thank you to my friend Mary for the recommendation! Nepenthe is one of the most scenic spots to enjoy a beverage and what looked to be some great (although a bit marked up) food. Make a visit to their super cool gift shop. I also came away with some great souvenirs here. Stay at The Blue Dolphin Inn - Cambria, CA - Cambria is such a cute little unassuming beach town. I absolutely loved it. Cambria is a great place to stay if you want to be close to Hearst Castle, our destination for the following morning. I fell in love with Cambria because it feels removed, peaceful, and largely residential. The hotel was a lovely and well-appointed roadside accommodation with all the comforts of larger, fussier lodgings. 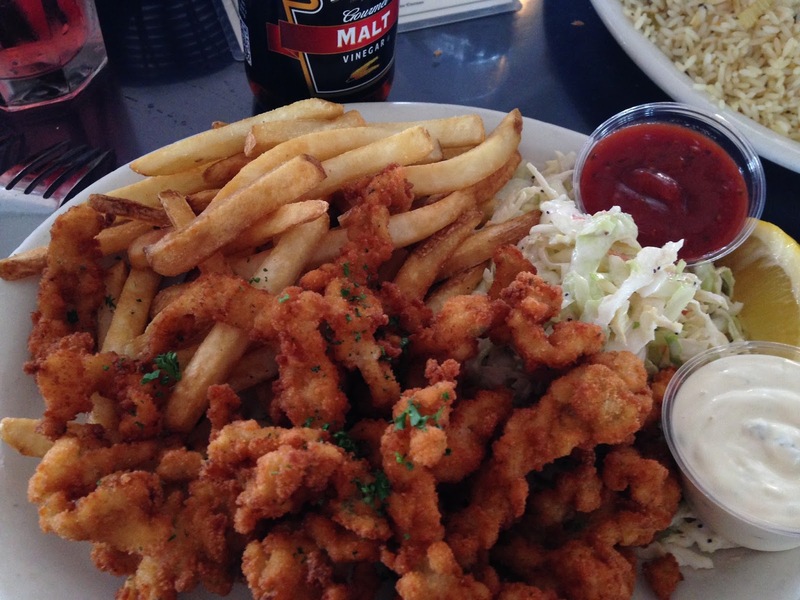 The town offers a few pretty good restaurants too. 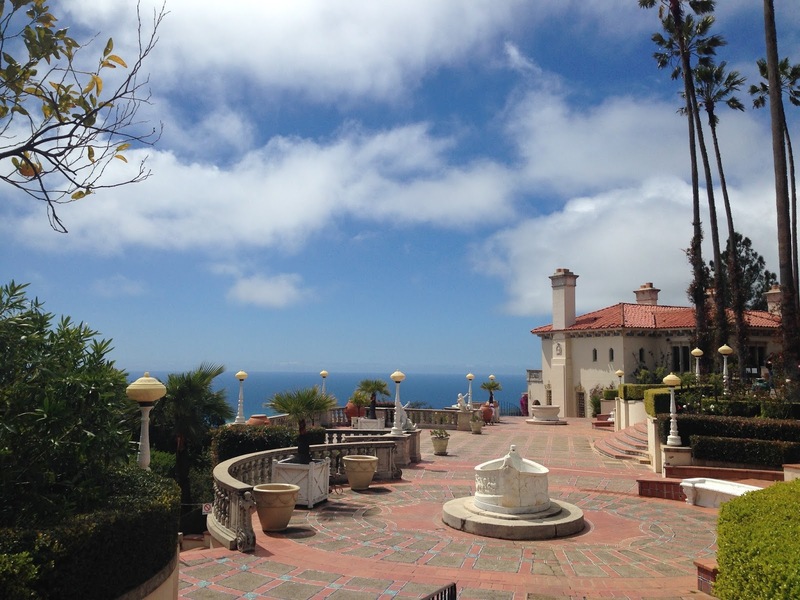 Attraction: Hearst Castle. A funky little shack at the top of a big hill. Seriously though, WOW. The bus ride to the mansion alone, its route marked by seemingly endless switchbacks and breathtaking panoramas, was worth the price of admission. 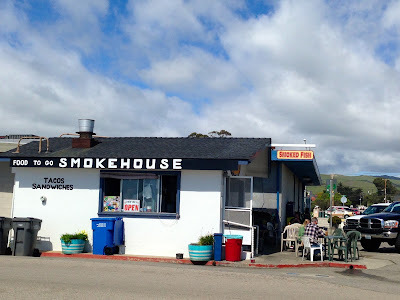 Lunch We happened upon Ruddell's Smokehouse for a beachside Smoked Shrimp Taco in what appeared, at least to my east coast sensibilities,to be the quintessential surf town - Cayucos, CA. 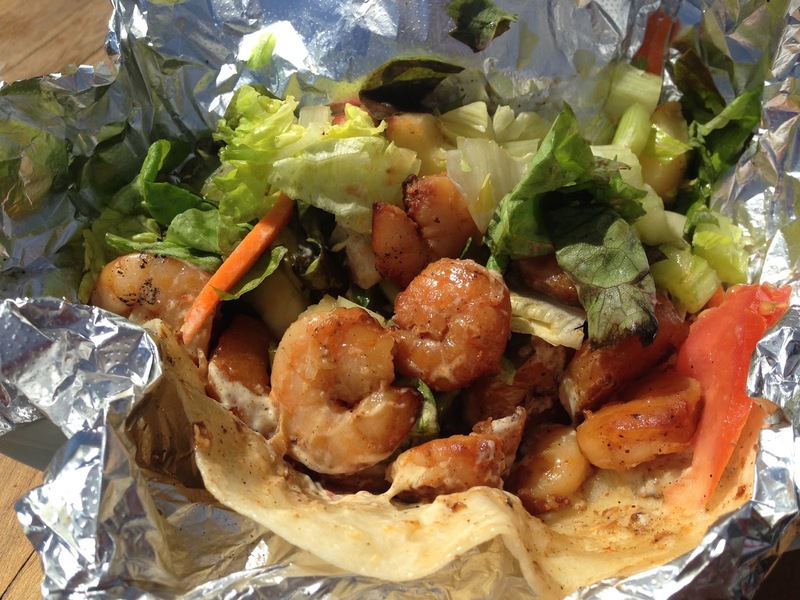 Smoked Fish Tacos are really something! A new taste for me but a great one to be sure. 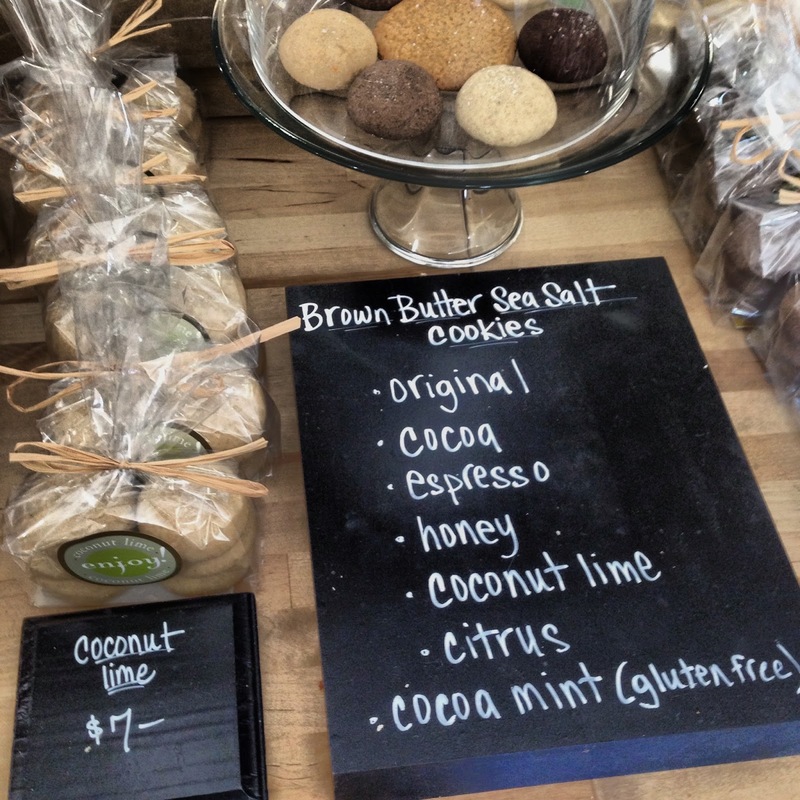 Snack Swing next door to the Brown Butter Cookie Company for Brown Butter Sea Salt Cookies. Yeah. You really should. These cookies were very unique and totally worth the stop. 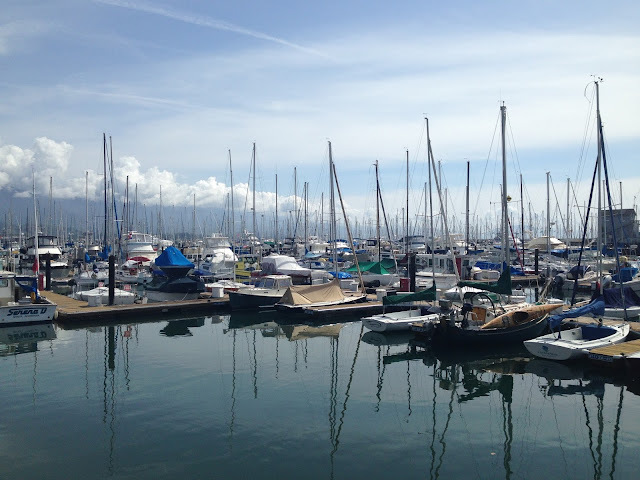 Stay Harbor View Inn - Santa Barbara - a nice enough and affordable place with, you guessed it, harbor view rooms in walking distance to nightlife, wharves and harbors. Didn't blow our socks off but very good for the price, a nice pool, and quite a good location! Lunch Santa Barbara is the place for amazing, authentic taquerias. Our choice was Lilly's, and it did not disappoint. They served perhaps the best tacos of our trip. Lilly's gets quite the line outside with tourists and locals alike. It pays to go early. They are also known for utilizing all parts of the animal, whether pork, beef or chicken. Though I didn't try the Tongue Tacos, they were surely popular with those patrons in the know. Dinner Night one in Santa Barbara brought with it a fantastic Dinner at The Lark. Small plates, eclectic cuisine, and a really vibrant social scene thanks to lots of communal tables. We also enjoyed the very friendly service, excellent, creative cocktails and fun-to-watch open kitchen. Fabulous find and one of the best combinations of great food and ambiance on this trip. The next morning, we took a long walk around the town to take in the local color before checking out and heading to LA. Lunch My good friend Monica gave us the heads up that the place to get great seafood (and people watching) was the famous Brophy Brothers. She was right! Great lunch here before we headed off to LA for the last leg of our trip. Stay: The Beverly Hilton -What fun. Shiny and up to date but still evocative of mid-century LA - right on the famed Wilshire Boulevard. We got a sweet deal here on Jetsetter.com. Our room was tiny but gorgeous. I would definitely stay again! Dinner at famed Rick Bayless' Red O- In West Hollywood on Melrose, this is a good place to people watch. Our table by the window was prime real estate to watch Maseratis pull up to the valet, one by one, with fancy if not famous people spilling out their doors. 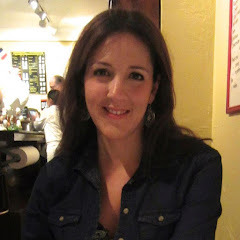 We are big Bayless fans (he specializes in Mexican cuisine) and the ambiance was excellent. Food was good enough but for the price I expected it to be a bit more flawless. Still, Red O was worth a visit and the perfect place to feel like we were a part of a real LA scene. Attraction: With a night flight back home, we had the whole day to explore LA. We began by taking a walk to Rodeo drive and as soon as we could justify it, a stop at Sprinkle's Cupcakes (they have a Cupcake ATM!) for a sweet treat of a snack. LOVED. The next priority for me was the Sunset Strip where we enjoyed seeing the haunts of our favorite performers (from The Doors to Led Zeppelin and beyond), from the trashy motel where Jim Morrison lived for years (the Motel Alta Cienega), to the infamous Chateau Marmont, The Whiskey a Go Go, and the Viper room, it was like a trip back in time for me. Somewhere along the way, we looked over our shoulder at the Hollywood Sign. The husband demanded one last lunch at In and Out Burger, and I did not protest. I think it's that crunchy, sweet onion they put on those burgers that really makes them. I am a fan. 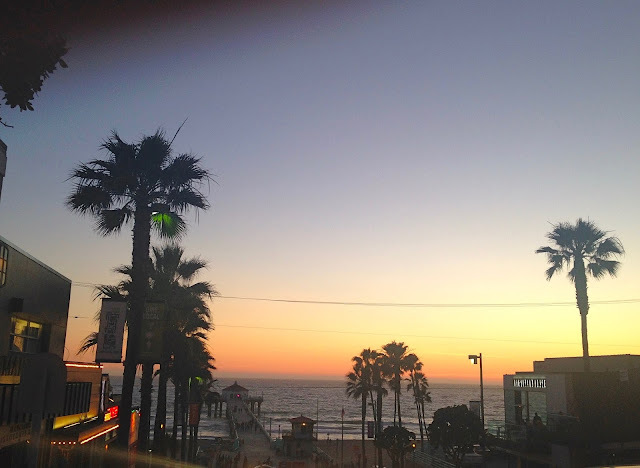 Attraction: As the evening rolled around, we headed to Manhattan Beach, which is closer than LA proper to the airport. A stroll on the boardwalk, a cocktail, and a long walk through town was a great way to take in the charms of this casual, young beach community, much more my speed than the Big City of Angeles. As the sun began to descend, we headed to return our rental car and check in at LAX. The next morning, as our redeye touched down on the east coast, my head flooded with great moments and my belly still very full from the stellar food and drink we enjoyed throughout. Our trip was a success. Eric Ripert is one of a just a handful of famous chefs who inspire me to a state of complete awe. I love everything about him, from the many global influences that inform his cooking (which is still firmly rooted in classic French technique), to his accent, and his down-to-earth, good guy persona. Aside from Ripert's well-deserved status as a monumental talent in the culinary world, he projects a genuineness that I find so endearing. And I am not alone. Helming one of New York City's few three Michelin Star restaurants could surely go to one's head, but Eric just seems so grounded. He's even a passionate philanthropist and is particularly active with my favorite food salvage charity, City Harvest. As if all this weren't enough, Ripert specializes in the food I love most in the world and easily the cuisine most represented here on Neurotic Kitchen - seafood. Like all big chefs these days, Eric has a T.V. show. I could watch it for hours on end. He travels the world for inspiration and often has great guests. He always manages to make haute cuisine seem approachable. If you still aren't sold, I recommend you look into his well-publicized bromance with bad boy chef counterpart, Anthony Bourdain. The two are hilarious together, and their recent exploits while galavanting around the seaport town of Marseilles made for some of the best television I've seen all year. Watching the two of them eat cheese was, for me, a near ecstatic experience. For all these reasons, my first trip to Ripert's Le Bernardin was truly a life-altering event, one that I simply must share with you. 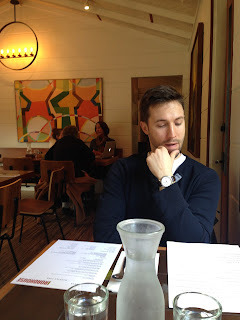 Please enjoy some of the highlights of our meal, and if you have time, read up on Eric. 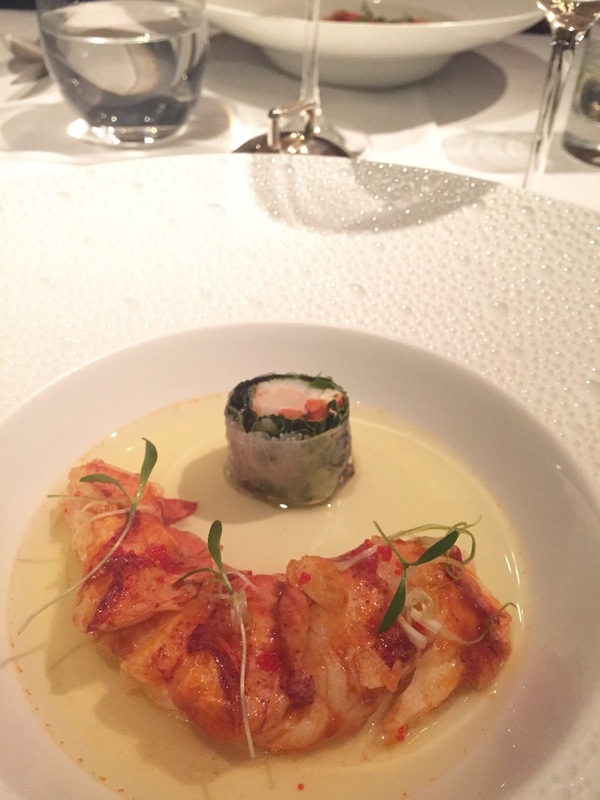 In addition to countless a la carte options, Le Bernardin has two tasting menu options for dinner. We opted for the Chef's Tasting Menu with wine pairings. It was decadent, but we didn't want to have any regrets. I say it often and it remains true - you only live once. We'd also been given a very generous gift certificate which, mercifully, lessened the impact on our wallets. That said, you can save a significant amount of money if you do not do the wine pairings, although I must say, they greatly enhanced the experience and were perfect accompaniments to the gorgeous dishes we enjoyed. 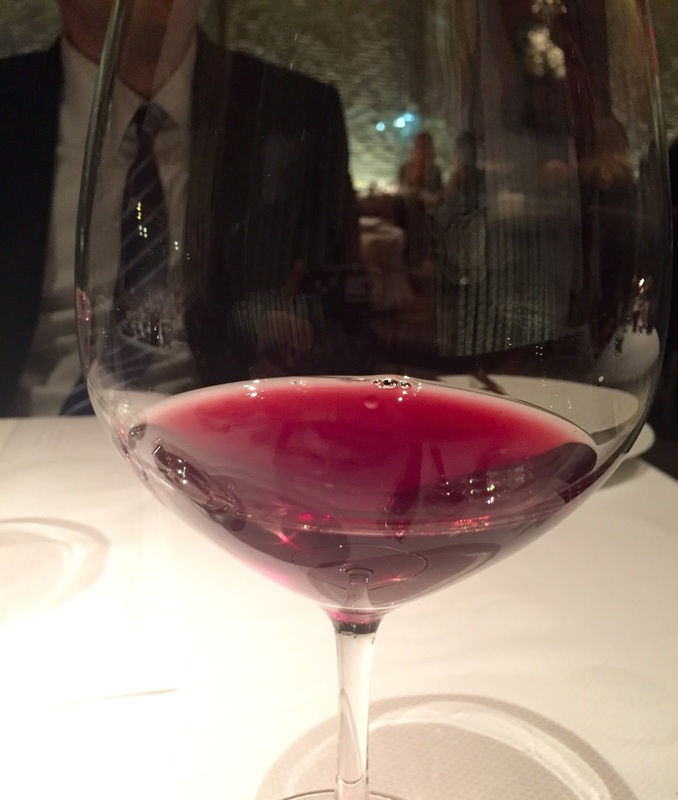 Aldo Sohm, Le Bernardin's wine director, is truly a master. He has his own wine bar as well, right next to Le Bernardin. Want the experience of amazing food without the huge pricetag? One of my favorite tips for experiencing fine dining on a budget is to go to fabulous restaurants for lunch. 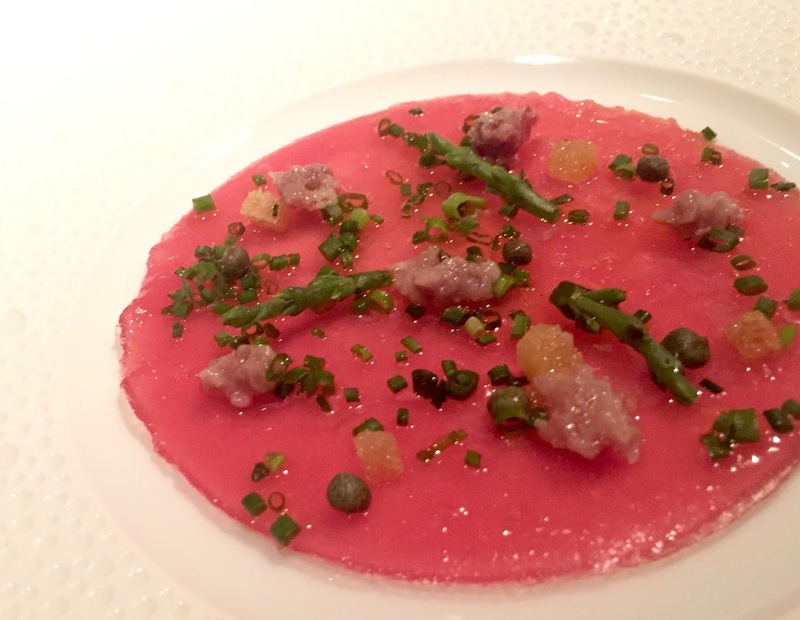 Sure enough, Le Bernardin does offer a three-course lunchtime tasting menu for $85. Monkfish in Mushroom Broth, just delicious. Exceptional wine pairings really enhanced the meal. And there you have it. A high point in my well-documented eating career. So inspired by Eric Ripert's genius, I decided I'd simply have to make one of his recipes right away that same weekend. Since we'd had our fill of Seafood, Steak seemed to make sense. 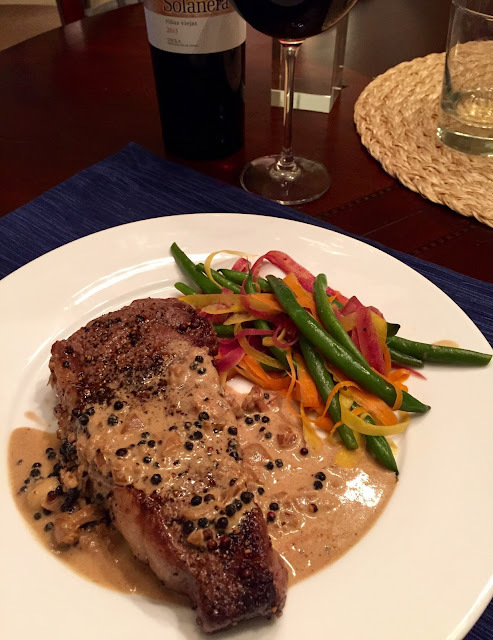 Pictured is our version of his decadent Steak au Poivre, a very approachable recipe that you can check out HERE. We prepared it with blanched French Green Beans sauteed in a little Butter and topped with shaved, raw Rainbow Carrots. Bon Appetit!! I am always surprised how many people still don't enjoy Kale, especially in light of its insane popularity these past several years. For me, Kale is a vegetable that I never tire of. 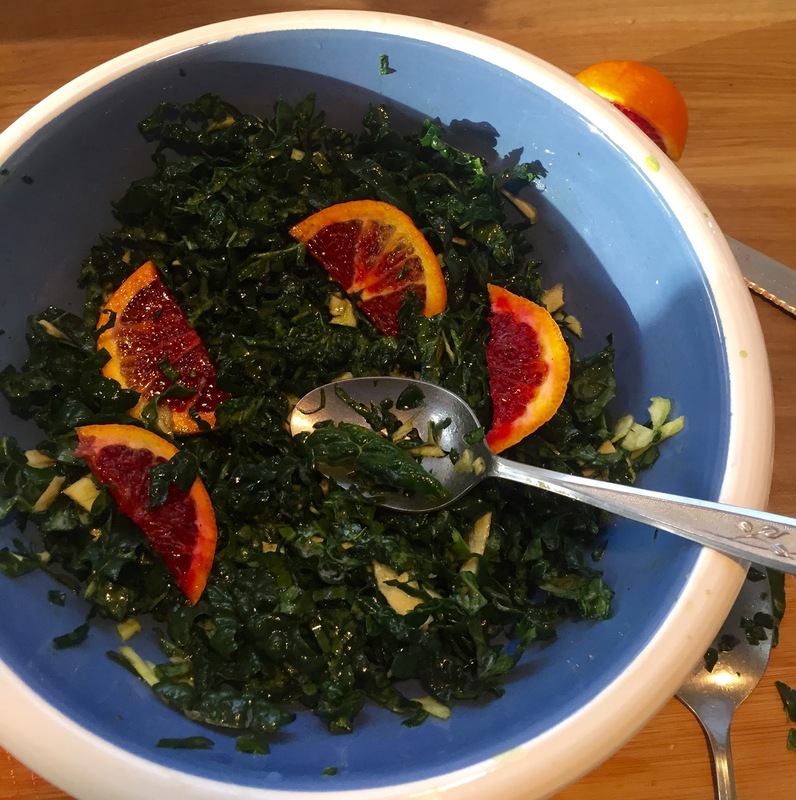 My recent attempt at incorporating strikingly vibrant, in-season Blood Oranges with Raw Kale Salad a success,I decided I should share yet another way to make this healthy green delicious. Now if you're with me, one of the Kale lovers, just don't overdo it. Would you believe that Kale-mania hitting such heights actually brought this cruciferous veggie-related health risk into the news? Keep in mind, you have to eat tons of Kale and other vegetables in its family to cause an issue. Everything in moderation is a good mantra for a reason. For today's dish, I drew inspiration from our reliable Kale and Parsnip Panzanella but added a zesty citrus vinaigrette. The key with raw Kale is to slice it into very, very thin ribbons and allow it to sit in dressing at least an hour, tossing occasionally so that the acids can soften and break down the sturdy Kale. This classic Kale and Apple Salad with Dates, or, if you're feeling like something a bit more unique, this Asian-inflected Kale and Coconut Salad served with sweet Yams. Kale can be very tough when it's raw, so it's absolutely essential that you slice it into the thinnest possible ribbons for this recipe. Next, you'll want to let the salad sit in the dressing at least an hour, so that the acids can soften the Kale. If you're short on time, there's always the option of a vigorous Kale massage. No really, it's a real thing. 1 Parsnip, outer layer peeled and discarded, then the remainder shaved with a vegetable peeler. Mix all the Vinaigrette ingredients together and set aside. In a large bowl, combine Kale Ribbons and shaved Parsnip. 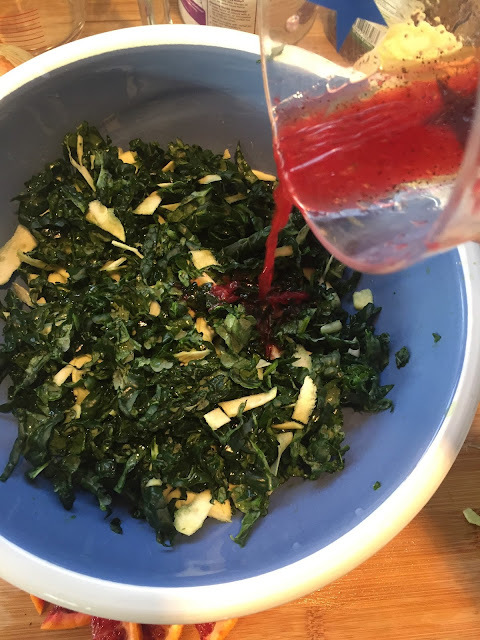 Give the Vinaigrette one last mix and pour it over the salad. Stir continuously for one minute to coat. Allow salad to sit in the fridge or at room temperature for at least an hour, tossing every 10-15 minutes. To serve, taste for seasoning and adjust if needed. Garnish with Blood Orange Slices. Enjoy!